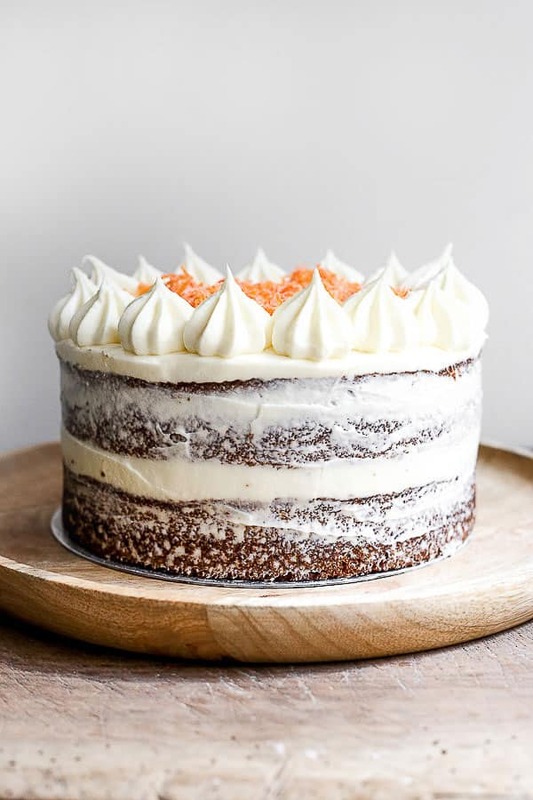 This Gluten-Free Carrot Cake is absolutely stunning. A beautifully spiced moist and fluffy sponge crammed with shredded carrots. Filled and decorated with the dreamiest cream cheese buttercream and sprinkled with candied carrots. 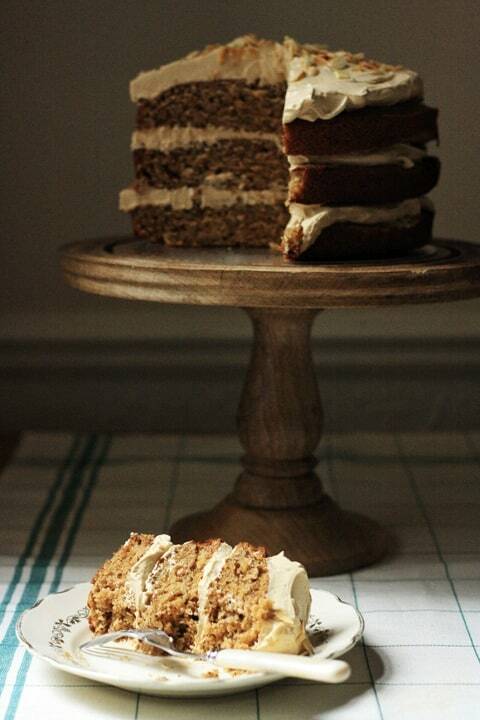 The joy that a simple carrot cake can bring is unbeatable. It feels so happy and homely. Our family were big fans of this cake over the past week and we were all sad when we finally finished the last slice. Although I think my jeans were thankful. I usually have a tendency to include a lot of add-ins in my carrot cake from nuts and dried fruit to coconut. For this cake though I went back to basics. 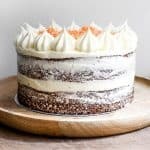 This Gluten-Free Carrot Cake is a more traditional affair which is almost elevated in status because of its simplicity. In no way though is it inferior in flavour. Far from it. This cake positively brims with personality, thanks to the gentle spices, a spike of black pepper and the carefully chosen gluten-free flours. 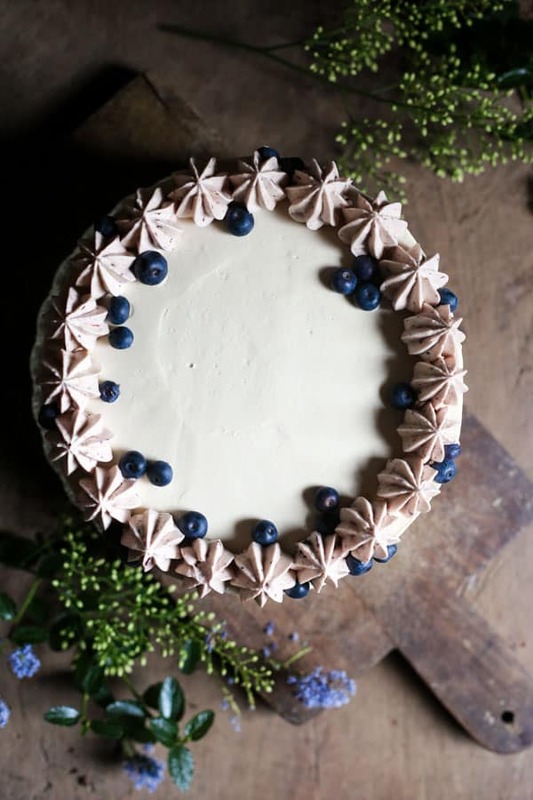 And it is all brought together with an easy dreamy cream cheese buttercream that you could happily eat with a spoon. 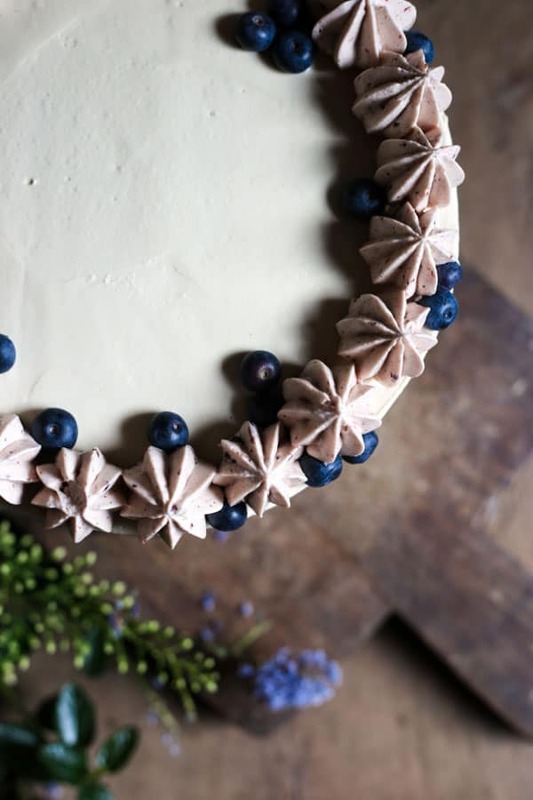 This cake is beautifully straightforward to put together. There are no special techniques and only two bowls are needed. One for weighing and one for mixing. Here are the basic details. Mix the muscovado sugar with the orange zest. Add the olive oil, eggs and the vanilla extract. 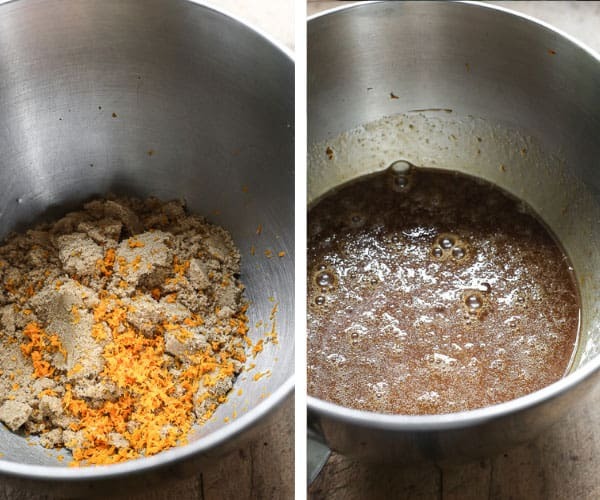 Whisk the flours with the raising agents and spices. Add the flours to the batter and mix. Finally add the shredded carrots. Divide into the two baking tins. Remove from the cake tins and leave to cool before assembling. Muscovado Sugar. We use muscovado sugar here for its deep rich caramel flavour. There is also a little more moisture involved than regular caster sugar so it helps to make the cake beautifully moist. Orange Zest. The bright citrus note lifts the cake and really enhances the carroty flavour. Olive Oil. In the past I have used melted butter to make my carrot cakes but here we use a light olive oil for two reasons. It is an easier ingredient to grab off the shelf but it is also lighter than butter so the cake is a little more fluffy. Baker’s Tip – make sure you use light olive oil which has a neutral taste. Absolutely not extra virgin olive oil which would be far too powerful in this instance. Black Pepper. The heat and spice of the black pepper is extremely subtle but it adds a special background note to the spice blend. 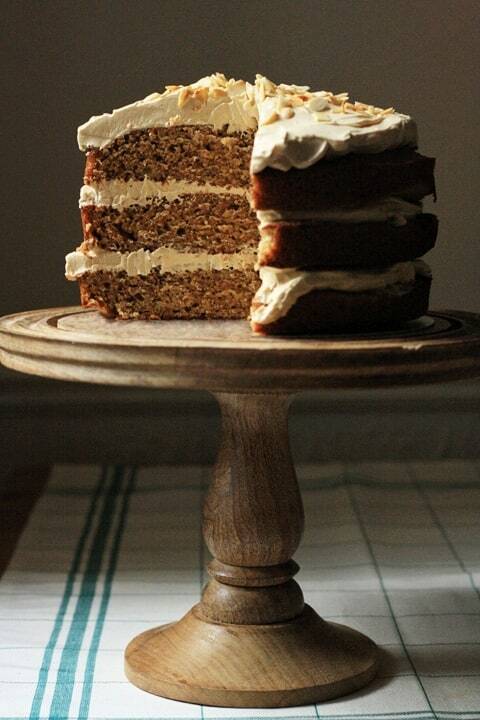 For this carrot cake it’s all about layers of flavour. For this recipe we only need two gluten-free fours. No starchy flour is needed here because this recipe uses a lot of eggs to compensate (5!) and the carrots give us a lot of moisture so we don’t need to worry about any dryness or crumbliness. Brown Rice Flour – this flour gives a beautiful whole grain earthiness. You can use white rice flour if you like. Sorghum Flour – the flavour of this flour is so good. It is slightly nutty, slightly sweet and perfectly robust. In order for the cake to bake evenly with no lumpy carrot bits the carrots need to be grated in equal size and length. 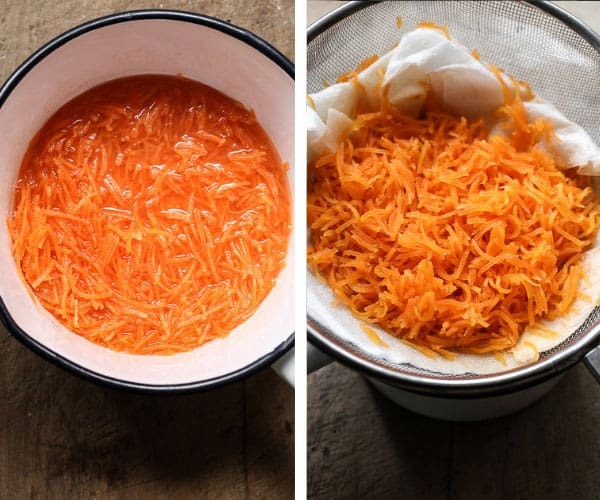 By using the thinner grater attachment on your food processor or a julienne peeler you can achieve perfectly grated carrots. 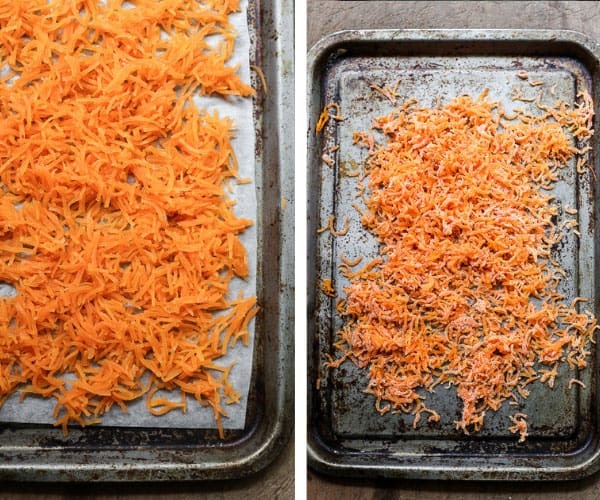 Use the widest setting and smoothly bring the peeled carrot down the grater in one movement. Lift the carrot off and bring it down the grater again. Continue until you have a nub of carrot left then discard it. Rubbing the carrot up and down the grater damages the flesh of the carrot which causes it to succumb to watery clumps. 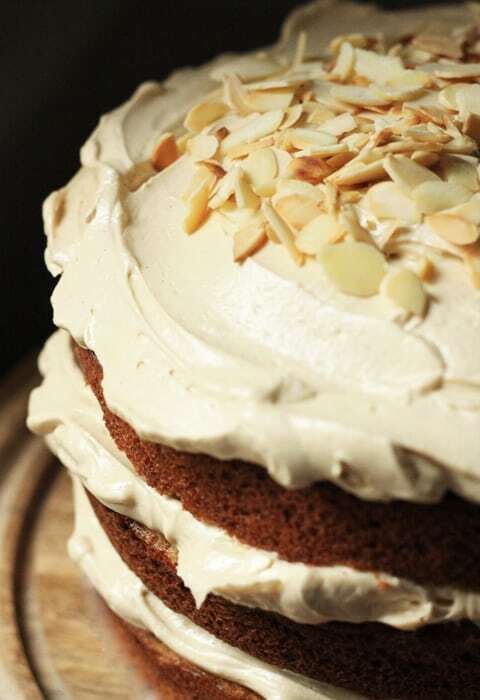 Baker’s Tip The higher quality carrots you use in this recipe the better your cake will taste. There really is a difference between the strong, slightly sweet and earthy carrots you can buy from the farmers’ market and the bland water carrots available from the supermarket. Obviously I recommend the former. 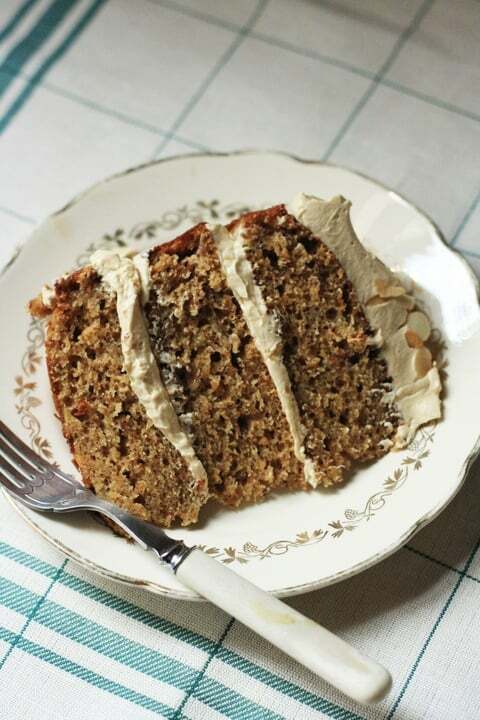 What add-ins can you include in a carrot cake? 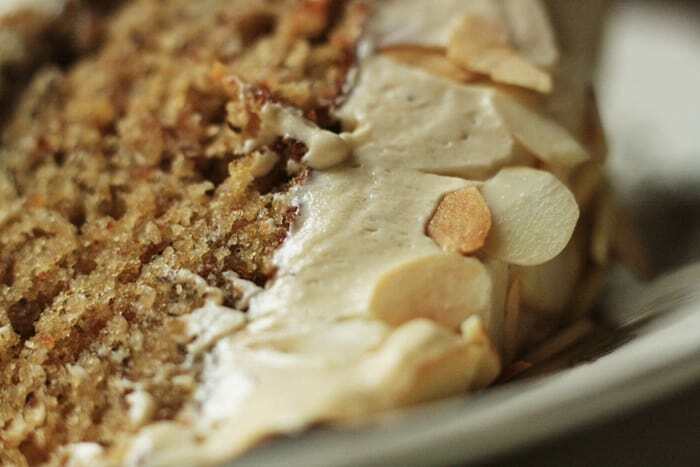 This recipe keeps the carrot cake beautifully plain and simple. However, you don’t have to make your carrot cake that way. There are plenty of optional add-ins you can stir into the batter just before pouring into the cake tins which you might like to include. You can add a handful of any of the below ingredients. 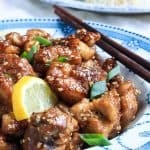 Diced crystallised ginger – check out my recipe for the best Homemade Crystallised Ginger. If you are really looking to spruce up your carrot cake then try this Golden Beetroot Carrot Cake, it is packed with sultanas, chopped pecans and shredded apple. Not to mention the delightfully earthy notes of fresh golden beetroot. Cream cheese buttercream is a match made in heaven for a carrot cake. This particular recipe is my absolute go-to and I use it also for this Red Velvet Cake. It has minimal ingredients and takes under 8 minutes to whip up. Beat the icing sugar and butter for 6 minutes until extremely light and fluffy. Add the vanilla extract, salt and cream cheese. Use full fat cream cheese if you can. The taste is far superior and I find it whips much better into the buttercream. If you are using a stand mixer, before you mix the icing sugar and butter wrap a tea towel around the mixer so the icing sugar doesn’t escape and cause a sugar cloud around your kitchen. Begin the mixer on low then build up speed once the sugar and butter are properly incorporated which also helps with the sugar cloud. 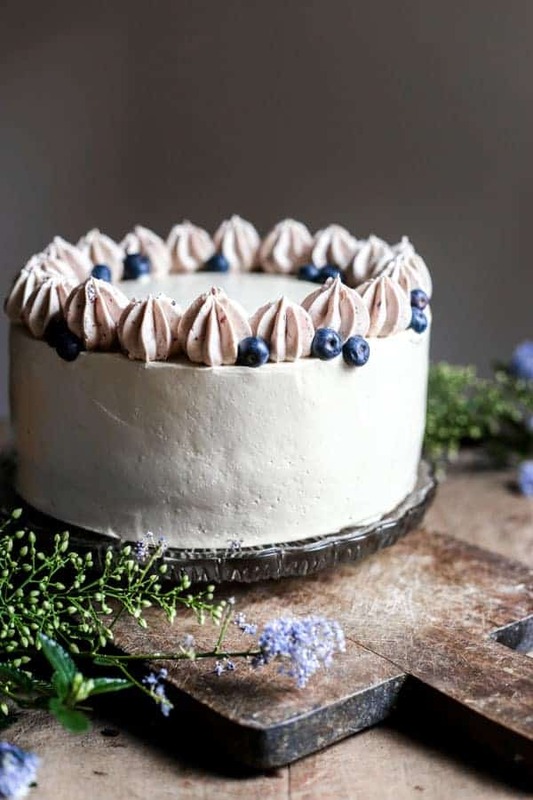 This Cream Cheese Buttercream is quite soft so decorate the cake as soon as your buttercream is ready as it doesn’t like being out of the fridge. Keep the cake in the fridge if the atmosphere is very warm. I can’t help it, I decorate all my carrot cakes with candied carrots. 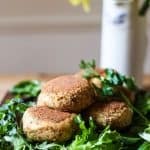 They are easy, incredibly delicious and deliver an excellent crunchy contrast on the top of the cake. Prepare a sugar syrup by heating the sugar and water. Add the shredded carrots and bring to a gentle boil. Drain and pat-dry the carrots. Spread the carrots out onto a baking tray and bake for 12 minutes. Turn off the oven, remove the carrots and sprinkle them with caster sugar. Return the carrots to the oven, leaving the door open, for two hours, so the sugared carrots can dry out. Baker’s Tip: You need the shredded carrots to be really dry after they have been boiled in the sugar syrup so they don’t become soggy in the oven. Storage. 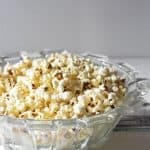 The candied carrots can keep unrefrigerated for up to two weeks in an airtight container lined with kitchen paper to ensure any residual moisture is wicked away. Are you looking for more Spring Cakes? If you make this Gluten-Free Carrot Cake then please leave a comment below and/or give the recipe a rating. 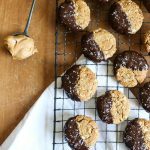 If you then go on to use this recipe as a launch pad for your own baking creation then I’d also love it if you’d share it and tag me on Instagram. It is so lovely for me to see your versions and variations of my recipes. Pre-heat the oven to 170°C/150°C fan assisted oven/gas 3 and line and grease two 8 inch x 4 inch round cake tins. Whisk the sugar with the orange zest until fragrant. Add the butter and mix until thoroughly combined. In a separate bowl whisk together the flours, baking powder, bicarbonate of soda, spices, salt and black pepper. Fold the flour into the wet ingredients one third at a time. Stir in the grated carrots until completely combined. Divide the batter between the two baking tins and bake for about 35 minutes (cover with foil after 20 mins). Cream the butter and icing sugar and mix for about 10 minutes until very light and fluffy. Add the salt and vanilla and mix again to combine. Finally add the cream cheese and mix until just combined. Pour the water and sugar into a medium sized saucepan and bring to a boil. Then turn down to a simmer for 2 minutes. Add the carrot and leave to simmer for a further 5 minutes. Strain the carrots and pat dry. Place on a baking parchment lined tray and bake at 180°C/160 /gas 4 for 12 minutes. Turn off the oven, remove the carrots and sprinkle them with the caster sugar. 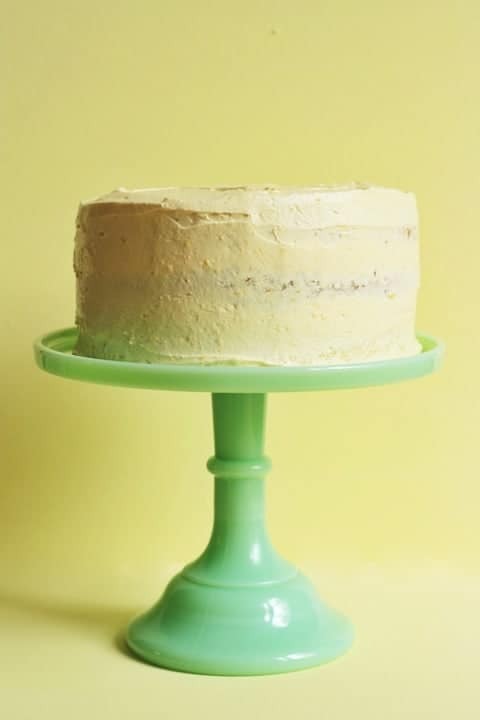 Place one of the cake layers on a cake board or cake stand. Fill a piping bag with half of the buttercream. Pipe concentric circles around the top of the cake layer. Use a small spatula to smooth so it creates an even middle layer of buttercream. Place the second layer of cake on top of the buttercream. Pipe concentric circles around the top of the cake layer. Use a small spatula to smooth so it creates an even surface layer of buttercream. 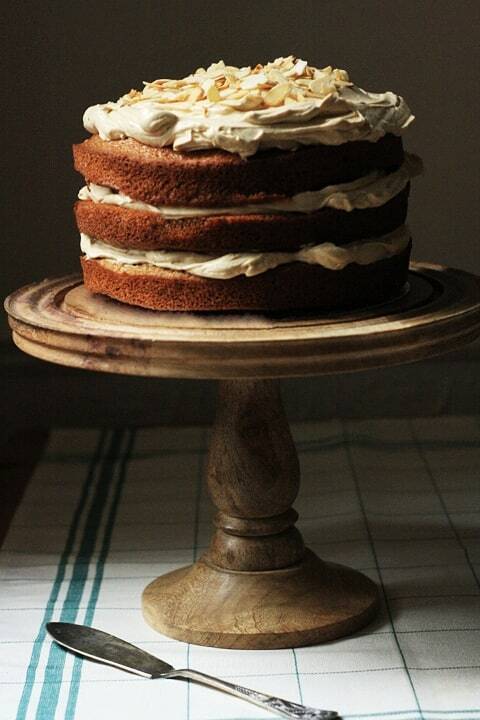 Use the spatula to spread a thin layer of buttercream around the sides of the cake to create a naked look. Pipe buttercream, using a piping tip of your choice, around the top of the cake. Then sprinkle candied carrots all over the surface. General Baking Notes: All recipes are developed with medium eggs, good quality vanilla extract (not essence) and kosher salt. Oven Temperature. I prefer to bake gluten-free cakes in fan-assisted ovens as they dry out the cake a little more. 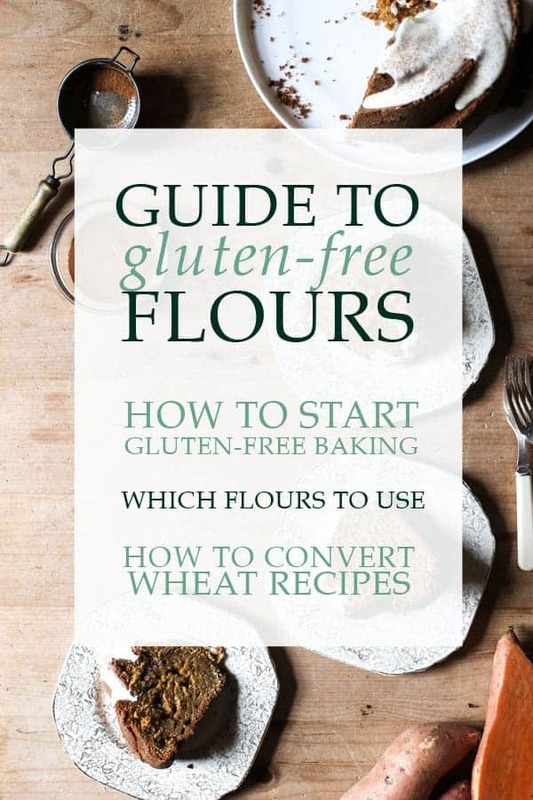 Gluten-free flours need more moisture in the batter so the fan-assisted oven helps the cakes cook more evenly. Gluten-Free Flours. You can use white rice flour instead of brown rice flour. You could also use gluten-free oat flour instead of sorghum flour. Olive Oil. It’s important to use light olive oil, not extra virgin or regular olive oil as you want the flavour of the oil to be more or less neutral. You could also use refined coconut oil or melted butter. The latter will give a richer taste. Grated Carrots. The carrots should be grated in even strips of equal size. 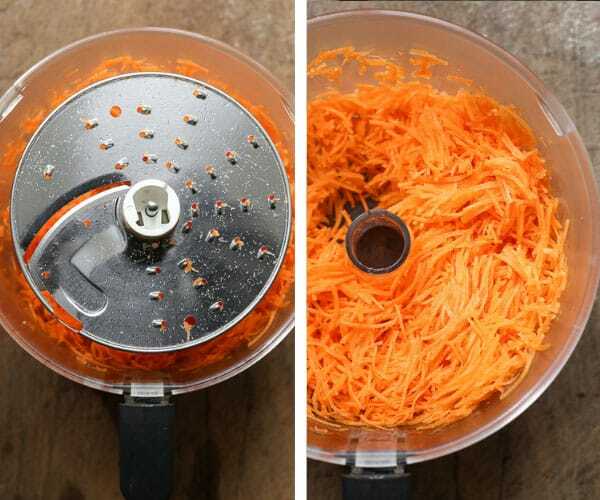 I recommend using the grating attachment on your food processor or a julienne peeler for perfectly shredded carrots. 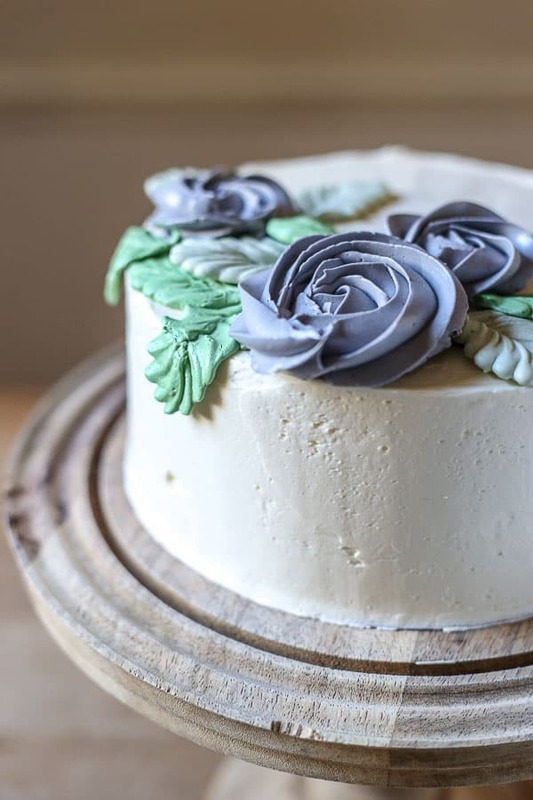 Cream Cheese Buttercream – for the lightest buttercream the icing sugar and butter should be beaten together for at least 5-6 minutes on a medium-high setting. Storage Because of the cream cheese in the buttercream the cake should be stored in the fridge where it will keep well for about 5 days. Bring the cake back to room temperature before serving. Freezing. The carrot cake itself can be frozen before decorating with the buttercream. Wrap the two layers up individually. Wrap well in cling film, then in foil to ensure no freezer-burn. You can store for up to three months. Remove the cake layers from the freezer the night before you want to decorate the cake. Defrost, then remove the wrapping and decorate as normal. 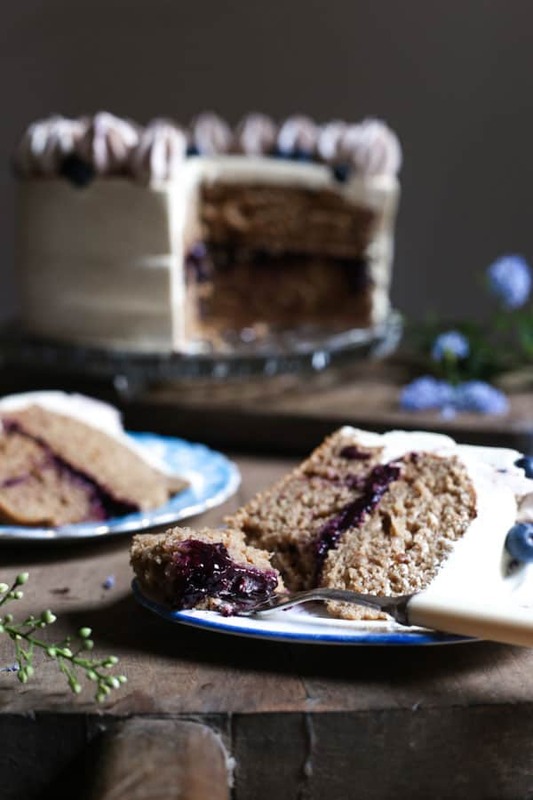 Apple Blueberry Maple Cake is refined sugar-free and gluten-free and so full of flavour. 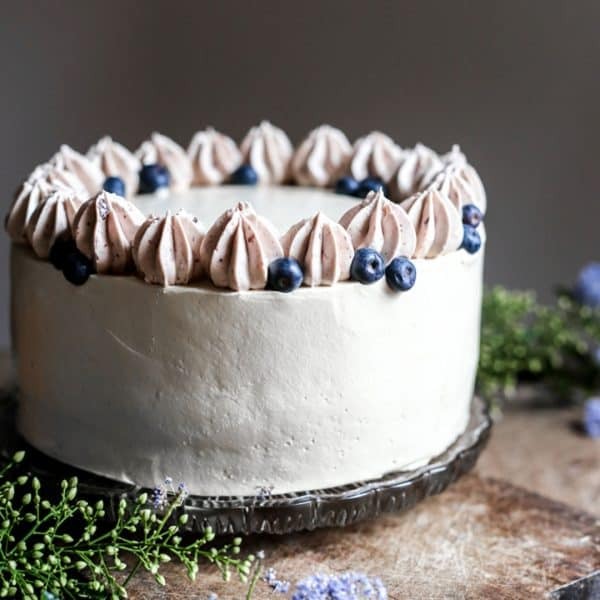 Filled with a blueberry chia jam and covered in a maple swiss meringue buttercream. 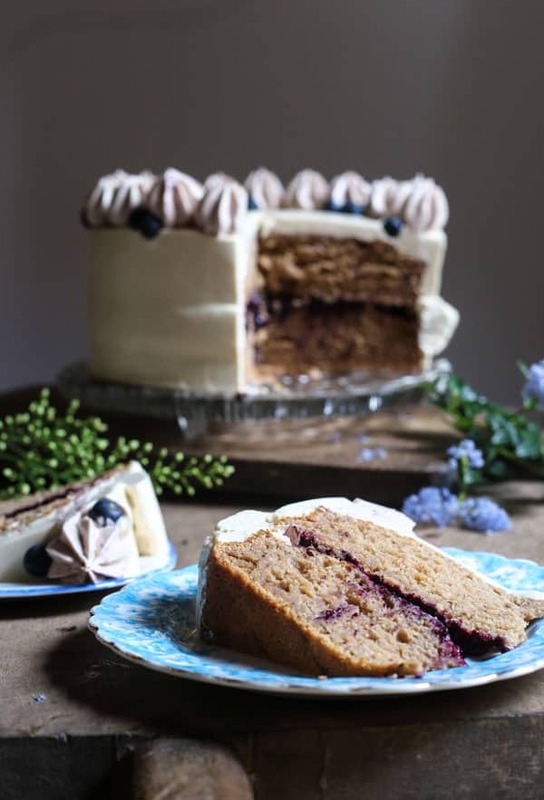 If you had a slice of this cake with no pre-amble or forewarning I guarantee you would be shocked to discover that this Apple Blueberry Maple Cake is made with absolutely no refined sugar. There is sweetness, of course, this is still cake. The sweetness though comes from potassium and fibre rich medjool dates, unsweetened apple sauce and just a splash of maple syrup. These three sources of ‘sugar’ are not just chosen for sweetness but for flavour too. 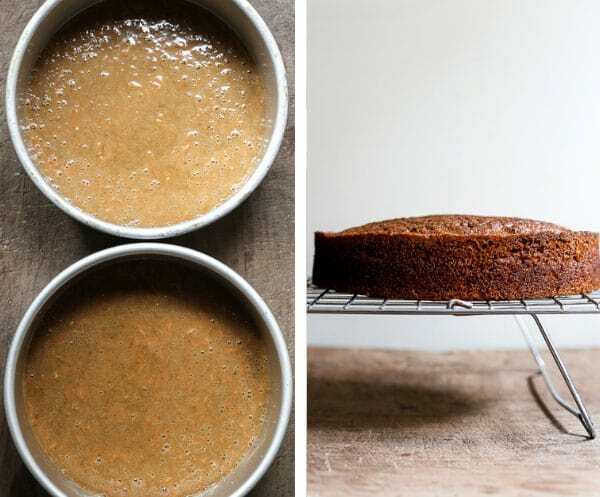 The tanginess of the apples combined with the rich dates and mellow maple syrup give a complexity to the cake which you just don’t get with regular old caster sugar. Plus it is a healthier choice. Although, this is no health food as again, cake is cake. It is a treat, but perhaps a more justifiable one if you are enjoying a ‘sugar-free’ January. The Blueberry Chia Jam which sandwiches the two cake layers together is also refined sugar-free and is freshly made. I adore blueberry jam and I think actually this may be my favourite way to have it as it’s beautifully soft, not tooth-achingly sweet. The ground chia seeds are used to set the jam so you only need a minimal amount of maple syrup just to bring out the flavour of the blueberries. Now, the Maple Swiss Meringue Buttercream, I am not going to kid you, is a little more tricky than regular old swiss meringue buttercream. It’s worth cracking though because the results are sublime. You shouldn’t have any problems if you stick to the exact method I’ve outlined in the recipe but you do really need a sugar thermometer to ensure the temperature of your meringue is correct. Maple syrup is a little more unstable than refined sugar so your buttercream may veer a little off piste if you’re not careful. 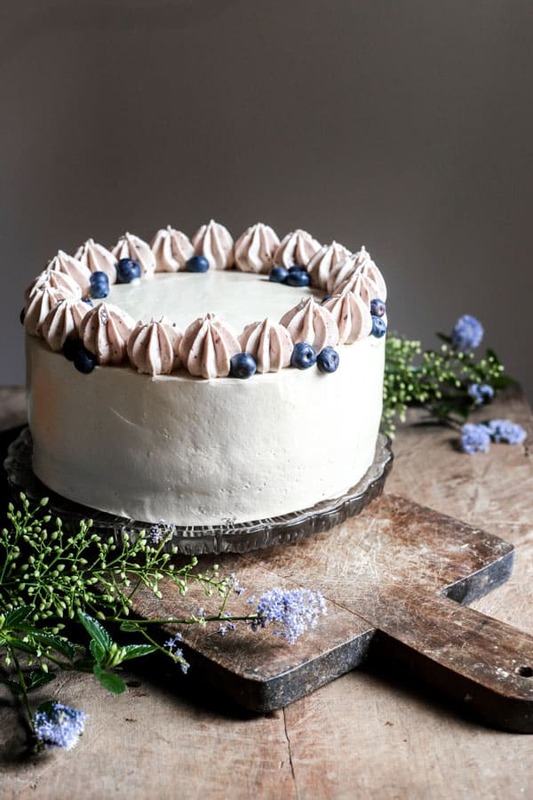 However, swiss meringue buttercream is incredibly forgiving and it can always be rescued even if you think your buttercream is too soupy or if it is too greasy and the buttercream is just not coming together. This means that the butter was too warm when you added it or your meringue hadn’t cooled properly to the right temperature before adding your butter. If this is the case then place your mixing bowl in the fridge for 10-15 minutes to chill. Bring out and beat again until smooth. Your butter might have been too cold when you added it. You can either keep on mixing and hopefully the butter will warm up and start emulsifying with the meringue. If not then warm the sides of the mixing bowl by placing over the top of a saucepan of warm water. The butter should melt slightly around the edges of the mixing bowl. Remove from the heat and beat again, hopefully your buttercream will come together. Most importantly with any swiss meringue buttercream, be patient and don’t get spooked by a curdled looking buttercream. You have probably done nothing wrong and just may need to keep on beating until it comes together and forms the most delicious smooth and fluffy buttercream. The other great thing about this cake is that it is also gluten-free. It uses a flour blend of oat flour, sweet rice flour, potato flour and tapioca flour. I love the oat flour for its unsurpassable butterscotch flavour which goes so perfectly with this cake but if you find oats don’t agree with you then you can substitute for sorghum flour. The taste of the cake will be different but still delicious. The sweet rice flour binds the cake together, mimicking the gluten-effects of wheat and gives the cake bounce. The potato flour is used to give the cake lightness and the tapioca flour is used for fluffiness and extra binding. 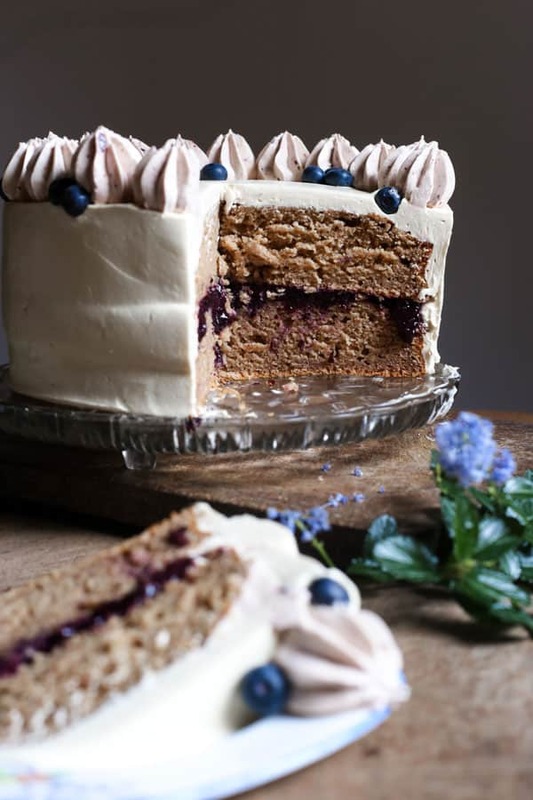 If you make Apple Blueberry Maple Cake then please leave a comment below and/or give the recipe a rating. If you then go on to use this recipe as a launch pad for your own cake creation then I’d also love it if you’d share it and tag me on Instagram. It is so lovely for me to see your versions and variations of my recipes. Pre-heat oven to 180°C/160°C fan/gas mark 4. Grease and line two 8 inch round cake tins. In a medium bowl, whisk together the oat flour, sweet rice flour, tapioca flour and potato flour, baking powder, baking soda, salt, and cinnamon then set aside. Place the dates and the boiling water in a small food processor or mini blender and blitz until completely smooth, scraping down the sides as and when you need to. 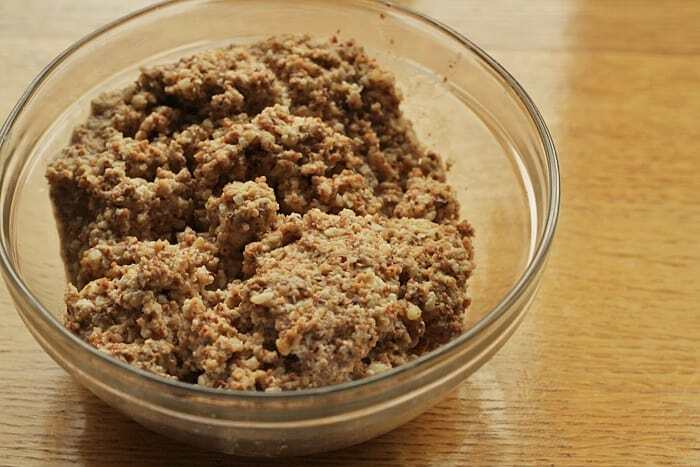 Pour the apple sauce, olive oil, maple syrup, vanilla extract and date paste into a large separate mixing bowl or stand mixer and beat until completely combined. Add the eggs one at a time, beating well after every addition. Mix in the dry ingredients, one third at a time to ensure it has all mixed in evenly. Divide the mixture between the two cake tins and bake in the oven for 30 minutes or until an inserted cocktail stick comes out clean. Turn out the cakes and cool on wire racks before filling with the jam and covering with buttercream. Place all the ingredients, except for the chia seeds in a small saucepan and cook on a low heat for 5-10 minutes until the blueberries have broken down. Blend the blueberry mixture a little bit, you don’t want it too smooth but a little bit pulpy. Pour the blueberries into a small bowl and stir in the chia seeds until combined. Place in the fridge for an hour to set. Heat the egg whites and maple syrup in a bain marie, stirring constantly until the temperature has reached 71°C. Remove from the heat and pour into a stand mixer with a whisk attachment. Whisk until the mixture forms stiff peaks and the temperature has reduced to about 32°C. Change the attachment to a paddle attachment. On a low speed add the butter slowly cube by cube. When you have almost added all the butter the mixture will look curdled. Do not fret – this is supposed to happen and just means you are nearly done, just continue to add all the butter. Once the butter is totally incorporated the buttercream will miraculously become a smooth velvety consistency. Add the salt, and vanilla extract and mix until thoroughly combined. The sponges often come out of the oven slightly domed and so to make the cake assembly easier I often trim the very top of the dome off each layer so they have a flatter surface to work on. Don’t trim too much or you will lose a lot of cake. Place one of the sponge layers on an 8 inch cake board and pipe a circle of buttercream at the very edge of the surface of the cake to act like a dam for the blueberry jam. Spread three-quarters of the blueberry jam on top of the sponge, right to the edges of the buttercream dam. Place the second sponge layer on top and cover the top and the sides of the cake with the buttercream. *to make the apple sauce you need about 6-7 apples (I used braeburn). Peel, de-core and roughly chop them. Place them in a saucepan with a few tablespoons of water and cook on low-medium heat, stirring occasionally, until the apples have cooked down to a thick pulp. I blended them once they were completely soft to ensure a smooth consistency. Weigh out 300g of the sauce for the recipe. at a reasonable price. Even better if you go the subscribe and save option. as it’s certifiably gluten-free and I order it through Amazon. which I love and you can get almost anywhere. It gives quick and accurate temperature readings meaning you can don’t have to guess at any temperatures when making candy, caramel or fancy buttercreams. I use mine all the time.
. It has a super grippy surface so the cake board clings tightly to it. It also tilts which is great for when you want to add things like chocolate chips or sprinkles to the sides of the cake. I have had this cake decorating turntable for years and years and I absolutely love it. 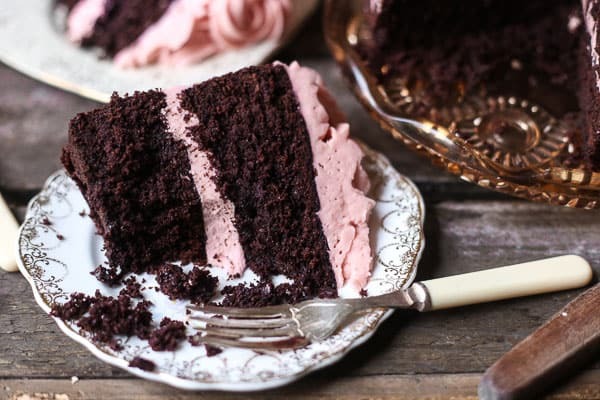 This Chocolate Raspberry Cake is a foolproof gluten-free buttermilk chocolate cake, sandwiched with a simple fresh raspberry swiss meringue buttercream. My house is calm and silent. My toddler has slept in his own bed for the full night through in weeks and my husband’s alarm hasn’t yet shrieked for him to get up and get dressed. If my husband is still in bed no doubt the dog is snuggled up next to him, both as unwilling to start the day as the other. The cats have been fed, one of which is curled comfortably around this laptop, her belly in the air for attention and the other is still eating his breakfast. Yet I am awake, googling recipes and writing. Despite my eye constantly twitching from excessive exhaustion, my whole body feeling so big and heavy all it wants to do is sink within our brand new duvet cover and hug my pregnancy pillow close to me, I am up and awake. Why? Welcome to the third trimester of pregnancy. I remember first time round people saying that the reason you can’t sleep in this final stage of pregnancy is nature’s way of getting you ready for all the sleepless nights ahead. I don’t need getting ready though, I’ve been having those for a couple of years already and I know the drill. What I need now is a head start on sleep to get ready for my return to night feeds but someone else has other ideas. This little baby I’m carrying is super active and wakes me up all night through twisting and squirming, except when I need to turn over which practically requires the assistance of a fork-lift truck or I need the loo for the twentieth time or my mouth is desert dry and can only be appeased by a gallon of water. Couple these restless nights with a day of full-time commitment to an extremely bouncy, chatty, effervescent and hungry toddler in potty-training then it’s safe to say my head is in a scramble and my body is like a lead balloon with the shape to match. How I long for the days of my first pregnancy when afternoons were given over to the Food Network and lazy naps on the sofa with a mountain of chocolate by my side. In fact the only thing that hasn’t changed is the mountain of chocolate. It’s fuel to me at the moment. Luke asked if we wanted to do anything for Valentine’s Day this year and I scoffed at the thought of going out. Meals out are not fun at this stage. I can’t eat a lot and feel very uncomfortable sitting at a table for any length of time. Plus all I really want to eat is the pudding so the rest of the meal is somewhat wasted. The cinema also puts me off, I’m not sure I could be in those skinny seats for a great length of time in front of an Oscar bait film. I’d rather watch something that didn’t make me think or cry at the moment. Also they finish way past my bedtime. So we’re celebrating Valentine’s this year with Netflix and Chocolate Raspberry Cake and I couldn’t be more happy. In fact, I don’t know why I’m blaming any of this lethargy on the pregnancy, really Netflix and chocolate cake are my go-to way to have a kicking time babies or no babies. 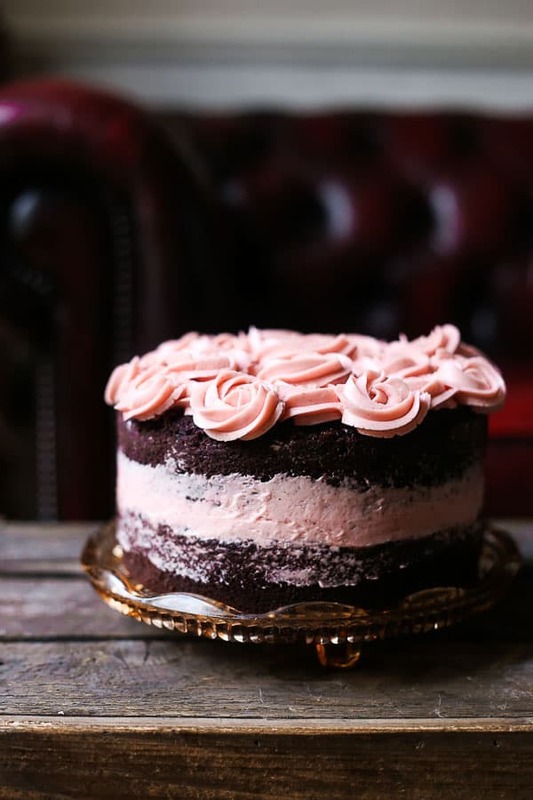 This Chocolate Raspberry Cake epitomises my favourite way of baking and eating cake. Simple and no-fuss. The gluten-free chocolate cake itself is one of my favourites that I return to time and time again. It’s moist and tangy from the buttermilk but incredibly chocolately thanks to cocoa powder and melted 70% dark chocolate. If you haven’t made swiss meringue buttercream before then I urge you to splash out on the extra time it takes. 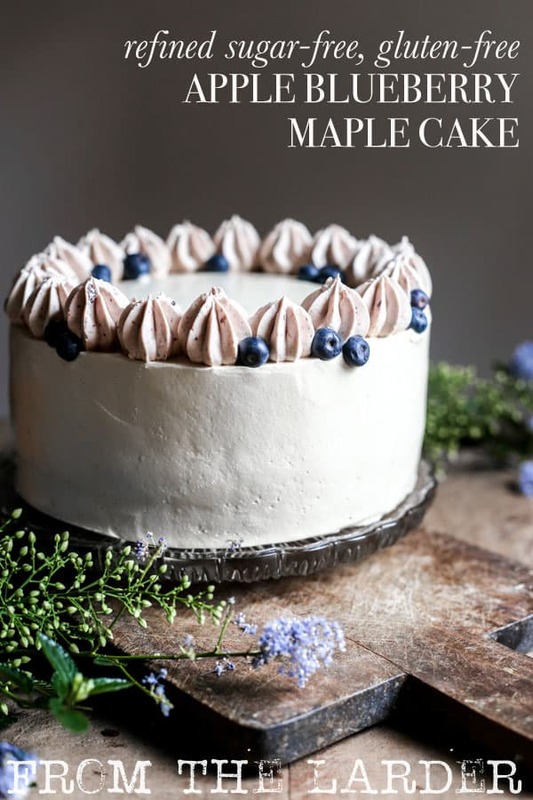 It sounds complicated as there are a couple of extra steps involved compared to a buttercream made with just icing sugar and butter but if you’re a regular reader or a customer of my cake stall then you’ll be aware that swiss meringue buttercream is my cake covering of choice. It’s not too sweet, incredibly buttery and is so easy to work with. If pureeing the fresh raspberries seems a little too much effort on top of making the buttercream then you can always use raspberry powder which also gives a lovely zingy flavour and colour to your buttercream but I thought fresh raspberries suited the celebration of Valentine’s Day. 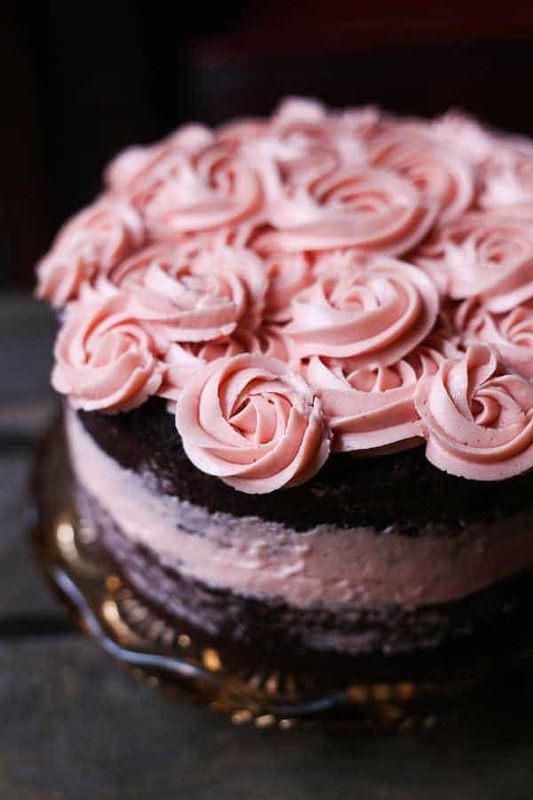 The piped roses on the top of the cake are a cinch I promise and if you are just making this cake for you and your Valentine now is the perfect time to practice as they two of you won’t care. All you need is a Wilton 1M nozzle, a piping bag and five extra minutes. Hold your piping bag straight up above the cake without angling it at all then squeeze the buttercream out in a circular motion starting from the centre. You want the swirls to be slightly on top of each other so they are nice and tight. 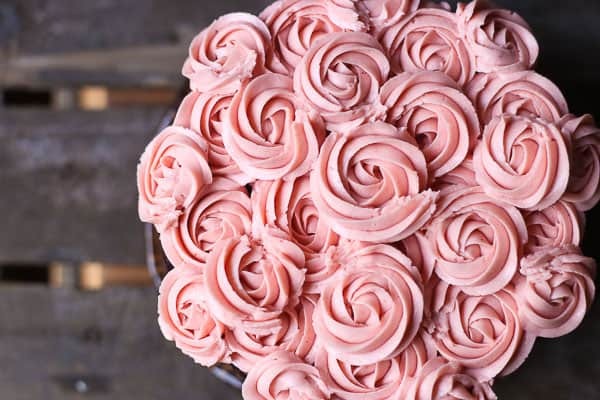 However, they don’t have to be neat or perfect buttercream roses by any stretch as once they are all piped onto the cake then the effect is lovely no matter what your piping skills are like. 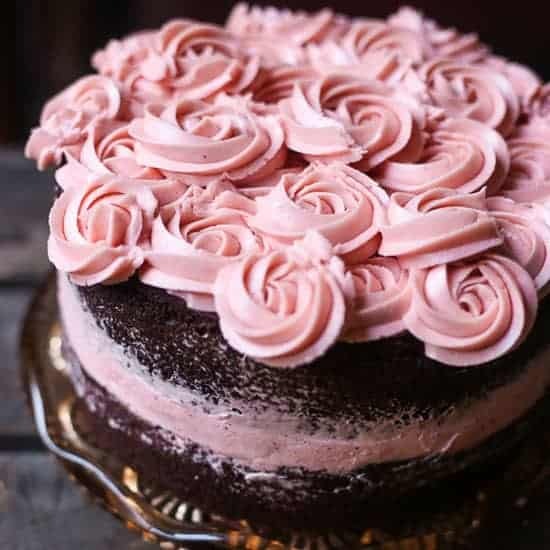 If one rose goes wrong, just pipe another on top to cover it or use a palette knife to carefully lift it off the top of the cake and start again. Actually this is a much quicker cake to decorate than covering the whole affair in a smooth buttercream icing as you’re not faffing for ages getting the corners perfect. 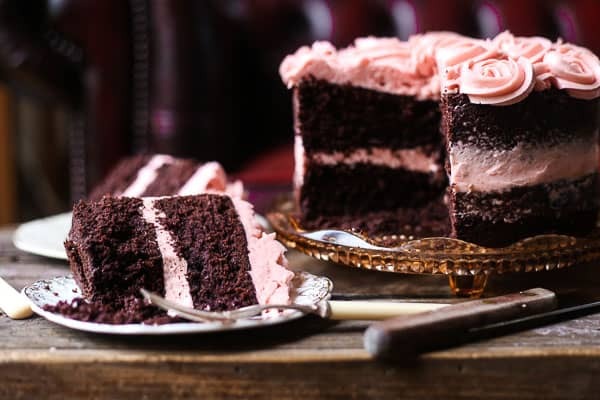 So I may be tired, over-emotional, maybe a little complainy, definitely huge and always hungry but at least I have a big hefty Chocolate Raspberry Cake to devour this Valentine’s with my partner-in-crime. Pre-heat oven to 160°C and line and grease 2 x 8 inch round cake tins. Melt the chocolate in a bain marie or a bowl set over a saucepan of simmering water, then set aside. In a large mixing bowl whisk together the flours, cocoa powder, espresso powder, bicarbonate of soda and salt until well mixed. In a separate bowl mix together the buttermilk, sugars, olive oil, eggs and vanilla then beat into the flour mixture. Finally mix in the melted chocolate until completely incorporated. Divide the mixture between the 2 cake tins and bake in the oven for 30-35 minutes until an inserted cocktail stick comes out clean. Turn out the cakes and cool on wire racks before covering with buttercream. Heat the egg whites and caster sugar in a bain marie, or a bowl set over a saucepan of simmering water, stirring constantly until the sugar has dissolved and the temperature has reached 71°C. Remove the egg whites and sugar from the heat and pour into a stand mixer with a whisk attachment. Whisk until the meringue forms firm peaks. Change the attachment to a paddle attachment. On a low speed add the butter slowly cube by cube. When you have almost added all the butter the mixture will look curdled. Do not fret – this is supposed to happen and just means you are nearly done. Just continue to add all the butter. Once the butter is totally incorporated the buttercream will miraculously become a smooth velvety consistency. Make the raspberry puree by tipping all the raspberries into a blender and blending on high for a couple of minutes. Press the puree through a sieve to remove the seeds. Then add the raspberry puree to the buttercream along with the vanilla extract and salt. At first the buttercream will look curdled again but just mix for a couple of minutes until it returns to its smooth state. 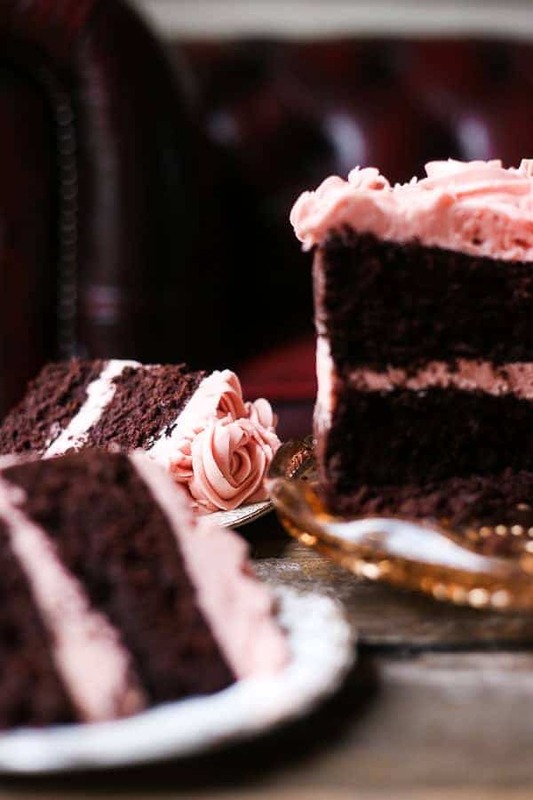 Spread the buttercream in an even layer over one of the chocolate cakes, then place the second chocolate cake on top. 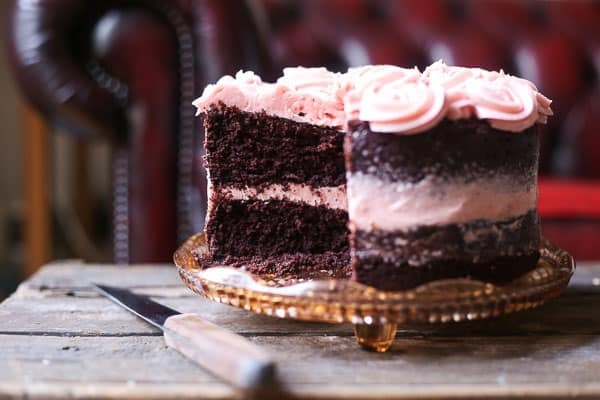 Smooth out the buttercream squidging from the centre of the cakes with a palette knife to create the naked effect. Pipe buttercream roses on top of the cake until completely covered. You can keep the cake in the fridge until needed but do serve the cake at room temperature. which are wonderful as they have completely straight sides so your layer cakes will be beautifully neat, the anodised aluminium means the heat disperses evenly throughout the cake without cooking the sides too quickly, which some darker cake tins do. The cakes slip out of the tins easily and they come in all the sizes you would need, although typically I use the 8 inch tins. which can so many different kinds of piping patterns and is one of the most useful piping tips to have handy. is an absolutely invaluable piece of kit in my baking. At the moment I’m embarking on the heinous task of cake testing. I know, I know it’s a pretty abrasive chore but I’m knuckling down and getting it done like the true professional I am. All in the name of whittling my recipes down so I can take only my very favourite cakes to the market stall I am launching next month. My baking to-do list is a little overwhelming at the moment. I have several notebooks full of scribbled down ideas, flavour combinations and inspiration gleamed from the efforts of others. This is not to mention the highly disorganised long yellow stickie that I keep on my desktop which is covering my screen so completely that it hinders any view of the perfectly chosen photograph of our holiday to Vietnam where we are smiling, having never been more happy, clinking our bottles of Saigon beer in front of the idyllic vista of Halong Bay. No, that’s being covered up with a stickie. I have to get my obsessive recipe writing and note scribbling under control so that some of these baking ideas actually get to the next level, i.e. I make some of these suckers. So this week I have launched an initiative to start at the top and work my way down each and every list which seems very logical and sensible and not at all unmanageable. Which is how the world’s best cake came into being. Actually, no it isn’t. No sooner had I launched this brilliant initiative, collated my various lists and put them in some sort of order then I completely cast them aside when I suddenly had the craving to make banana cake. 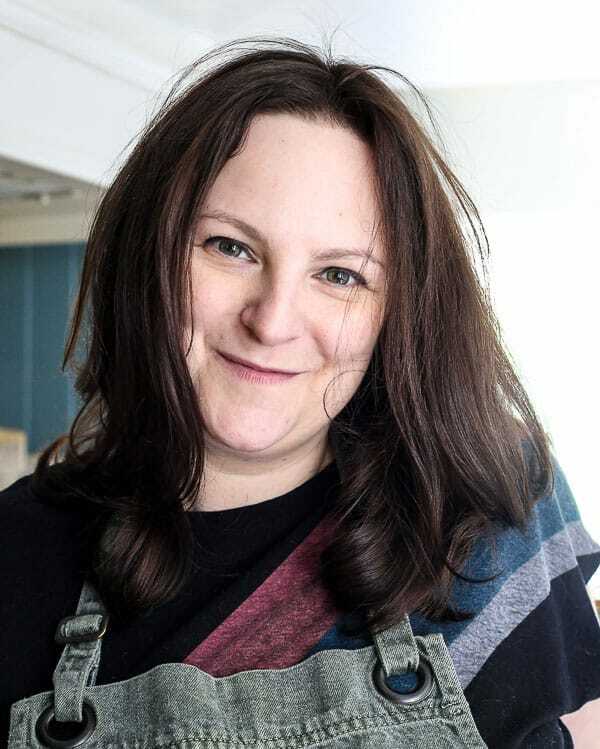 I have run several cake stalls in the past and it’s very noticeable the kind of cakes people like, proper grown up adults like the victoria sponge or lemon cake, people in their 20s like the chocolate cake and kids like the cupcakes. I, on the other hand, have a bit of a thing for banana cake. I don’t necessarily mean a dense intense banana bread, which is yumola, don’t get me wrong, but banana cake, light and fluffy with a pinch of icing, is what floats my boat. And that is why I always keep bananas in the house as I don’t know when the mood will take me. So what I’m saying is that my quest to make some sort of inroads into this baking to-do list wasn’t particularly helped by the fact I had to make a banana cake right here right now. This poor innocent banana cake didn’t even know I had a list, but in it bounced, eager to please, oblivious of all the other recipes seething with jealousy that this precocious young upstart had leapt to the top of my to-do list without putting in any of the grunt work in the early rounds. And then, like a spoilt young prince it then claimed the hallowed crown of the best damn cake I have ever had. It all began with some homemade almond and cherry ripple ice cream. Which was on the list and which I ate. Mmm delicious research. However, during the making of the almond ice cream base my recipe required me to soak some ground almonds in milk and cream, then once my recipe had decided enough soaking had been going on I was required to strain the mixture, dispose of the ground almonds and carry on making my ice cream with the infused milk and cream. Now, I don’t like to dispose of anything which would have a better home in my tummy so, although it wasn’t clear what their immediate use would be I covered the almonds with cling film and put them in the fridge. They lasted in there about a day which was when my banana cake craving hit and they were soon drafted in to participate in the banana cake of dreams. And that my friends is how I made the best damn cake I have ever had. Plus I learnt a valuable lesion, from now on I am always soaking my almonds before adding them to any cake. The moisture it added was unbelievable. without dampening the sponge. It means a little more preparation has to go into your batter but sometimes you just have to go the extra mile to reap your sugary rewards. To prepare the almonds you just need to lay 250g of whole unblanched almonds onto a baking tray and roast for 10 minutes at 180°C. Remove them from the oven and pour into the food processor so you can grind into crumbs. Once the almonds are completely ground then pour some whole milk (or half milk, half cream) over so they are not quite covered. Give a good stir then leave overnight for the nuts to soften and absorb the milk. 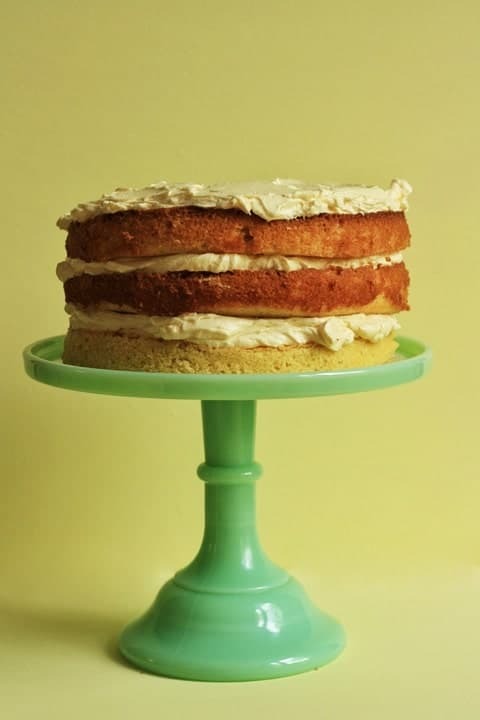 The banana and almond sponge is made even more glorious by the cloud-like whipped toffee buttercream adorning each layer, adding the perfect amount of dreaminess to each bite. I adapted Delia Smith’s Sticky Toffee Icing for the job which I then whisked into my favourite whipped vanilla buttercream. This amount of buttercream is perfect to ice about 12-14 cupcakes or 3 thick layers in a layer cake. If you would like to ice the outside of the cake as well it’s doable but you would have to double the buttercream ingredients. So, fun and cravings now over, I’m returning to my to-do list, whereupon I am now sentencing myself to the completion of a chocolate and whisky bundt cake with chocolate caramel drizzle. As I said, it’s a heinous task. Pre-heat oven to 180°C and line and grease three 20cm sandwich tins. In a large mixing bowl beat the sugars, eggs, buttermilk and olive oil. Mash the bananas well then add them to the mixing bowl along with the vanilla. Drain any loose liquid from the ground almonds then add them in as well, beating everything together until smooth. In a separate bowl sift together the flour, baking powder, bicarbonate of soda, cinnamon, nutmeg and salt. Add the flour to the rest of the batter and mix together until just incorporated. Pour evenly into the three sandwich tins and bake in the oven for 18-20 minutes until golden and coming away from the sides. Turn each cake out of the tin onto a cooling rack and leave to cool. Meanwhile make the buttercream by melting the evaporated milk, 100g of the butter and brown sugar in a medium saucepan. Simmer for 4 minutes then remove from the heat and leave to cool. In another saucepan whisk the flour, 100ml of the milk and the vanilla seeds until smooth. Heat on low until the mixture has thickened then gradually add the rest of the milk in a slow stream, whisking all the while to avoid any lumps which would be quick to form. Whisk hard until the mixture just touches a boil and has thickened. Remove from the heat immediately and continue whisking for about 3 minutes. Strain to guarantee no flour lumps then leave to cool. Whilst the toffee sauce and the flour mixture are cooling, beat the rest of the butter (225g) and the caster sugar for about 4-5 minutes until light and fluffy. Then add the cooled flour mixture and beat for a further 3-4 minutes until even lighter and fluffier. Finally pour in the toffee sauce and beat the buttercream for a final 2 minutes to fully whip it all together. The buttercream can be applied as soon as the cake layers have completely cooled. One of the film websites I read recently had a feature where all the contributors had written about the worst tropes which are fallen back on time and time again on film and TV. One particular entry on this list decried the timeworn use of characters dancing in the kitchen. The writer said it was clichéd, unrealistic and twee. ‘C’mon, who does that?’ they lamented. Well, I do as it happens. I do it a lot to boot and I don’t mind who knows it. Obviously. The two examples of this common trope which immediately spring to mind are at the end of Mermaids which I re-watched last week where they wiggle along to ‘If You Wanna Be Happy’ whilst setting the table. This scene not only led me to become obsessed with that song when I was young, but also made me desperate to be part of their wackadoo family. As a sidenote, I was extra surprised and saddened to hear of Bob Hoskins’ passing a few days ago as it felt like I had only just seen him on top form, I had forgotten he was in Mermaids and on my re-watch his was the performance I enjoyed the most. Such a wonderful actor. The second example is in the classic episode of Dawson’s Creek when the gang all band together to save the Potter B&B by dancing around the kitchen at breakfast time. Of course their dancing seduces the grouchy critic Mr Fricke into thinking that the Potter B&B is the best place he’s ever stayed in the world and they get a stellar write up. Works every time; Four in a Bed take note. I refuse to believe that these moments are embarrassment ridden or cheesy but they certainly serve as encouragement for me to dance more, for better or for worse. In our house we love to dance badly everywhere, the poorer the dancing is the better. We throw ourselves around to the radio first thing in the morning, in the sitting room to perk us up on a Saturday afternoon and most importantly and significantly for this post, in the kitchen. Whilst waiting for butter and sugar to cream, whilst thumbing through cookbooks and most common of all when we are doing the washing up. It is the only thing that makes the dreary chore remotely bearable. From his very first afternoon in our house whilst we were making the Sunday lunch Puppy has found our love of crazy dancing the best thing in the world. All I have to do is start to shimmy a little bit in time with Katy Perry and he has jumped up ecstatically, paws reaching for my hands so we can prance round the kitchen absurdly like a couple of escaped lunatics. The cats aren’t as impressed. There are a few songs which absolutely guarantee a good old bop, our current favourite is Pharrell Williams’ Happy which is just invokes such joy but also sends me into fits as it goes hand in hand with those gosh darn hilarious minions. A particular favourite though, and you’ll be happy to know I am now coming to the crux of the matter, is Escape (The Pinã Colada Song) by Rupert Holmes. We always put it on when feeling gloomy to cheer ourselves up. As soon as its opening drum beat kicks in Puppy immediately assumes the Tom Cruise from Cocktail swagger, well if Tom Cruise were tiny, furry, four-legged and drunk; still he has the charm in spades. 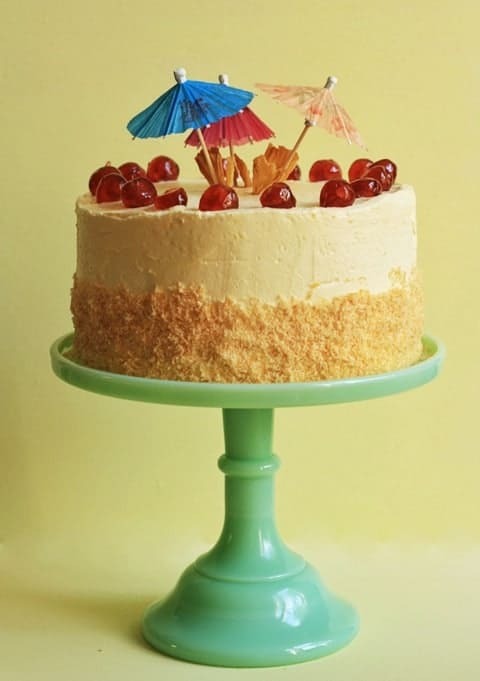 I was obviously listening to this song when I dreamt up this cake and the thought of it makes me smile, not just because it’s delicious but it also incorporates all the happy-go-lucky flavours of sunshine and paradise. It reminds me of dancing round my kitchen with my family and most importantly, it has glace cherries. I have made this cake several times now and usually when I make something repeatedly I like to tweak things here and there, perhaps modify the icing, take a layer out, change the decoration. This incarnation though was perfect the first time I baked it and I have made it the same way ever since, even down to the number of cocktail umbrellas on the top. This cake was made this week for a double celebration, it was a request from my husband whose birthday it was a few days ago and I also wanted to include it here to mark my official 99th post. Now, many people may choose to celebrate going into triple figures but hey I like 99. 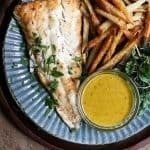 Plus it’s the bank holiday so I wanted to make sure this recipe was on offer to you should you want to make it and dream you are escaping to a tropical island. Heat the coconut milk until boiling then remove from the heat and stir in the desiccated coconut, vanilla and Malibu. Leave to soak for 30 minutes so the coconut softens. Meanwhile heat the oven to 180°C then line and grease 3 x 20cm round sandwich tins. Beat the butter and sugar in a stand mixer on high for about 5 minutes until the mixture is light and fluffy. Add the eggs one at a time until evenly combined. Sift the flour with the baking powder. Fold into the butter, sugar and eggs alternately with the coconut mixture until just incorporated. Divide between the tins and bake for 20-25 minutes. In a small bowl blend the cornflour with a bit of the whizzed up pineapple until it’s formed a smooth paste. Put all the ingredients in a saucepan and stir constantly on a medium heat until it begins to boil. Turn down heat and keep stirring as it thickens. Remove from heat and leave to cool. Heat egg whites and caster sugar in a bain-marie, stirring constantly until the sugar has dissolved and the temperature has reached 160°F. Remove the egg whites and sugar from the heat and pour into a stand mixer with whisk attachment. Whisk until the mixture forms stiff peaks. Change the attachment to a paddle attachment. On a low speed add the butter slowly cube by cube. When you have almost added all the butter the mixture will curdle curiously. Do not fret – this is supposed to happen. Just continue to add all the butter. Once the butter is totally incorporated the frosting will miraculously become a smooth velvety consistency. Add the salt and the pineapple curd. Mix in quickly and lightly. 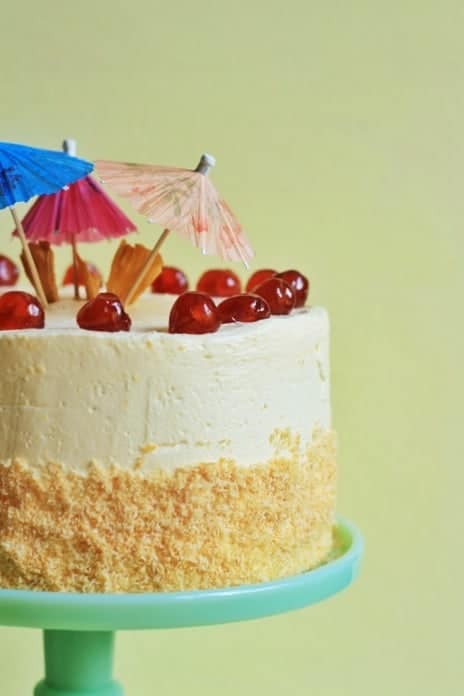 Decorate the cake with toasted desiccated coconut, sun-dried pineapple, glace cherries and cocktail umbrellas. The reason I have been absent from posting for a few days is a very good one. 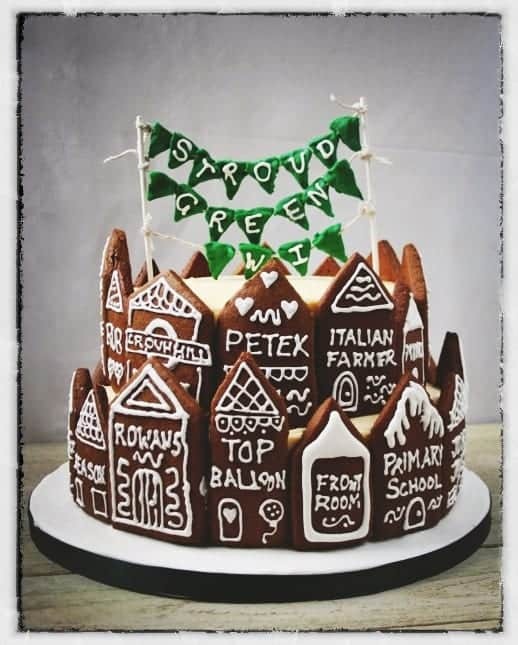 I have been baking this lovely Chocolate Gingerbread Cake extravaganza with stem ginger frosting and decorated with gingerbread houses, each representing one of beloved buildings in Stroud Green where I live. I was asked by our WI President to make the cake for our Christmas outing to the panto. A big group of giggling women trooping off to the new Park Theatre in Finsbury Park to see Sleeping Beauty is an occasion in and of itself and we definitely made our presence known. However, the cake was also in celebration of the two year anniversary of the founding of Stroud Green WI. It’s a fantastic group of women of all ages and backgrounds and we meet once a month for a catch up about local events and charities that we are involved with and also for some brilliant activities. This year has been an amazing year for our WI, we have has some fascinating talks about design and forensic science, a visit from Wildes Cheese, dress-making lessons from Clare-Louise Hardie from the Great British Sewing Bee, quilting, sugarcrafting, a local history walk, a summer picnic. And a hell of a lot of cake, which is the most important thing obv. So I was only too happy to bake this cake and I wanted to make sure it was really special. The templates for the houses were made the WI way, using card and a craft knife. The sizes I went with were 10cm x 4cm for the tall thin houses, 10cm x 6cm for the stations and big buildings like Rowans bowling alley, 9cm x 5cm for the average sized buildings and 8cm x 4cm for the diddy ones. To calculate how many you will need, wrap a piece of string around the circumference of the cake tins then measuring it against a ruler. I then divided the circumference into the various widths I had chosen, deciding which houses would fit best where. The Stroud Green WI banner was made with sugarpaste, hung on string and tied to cake pop sticks. Oh, and in case you are wondering – the panto was excellent too! Pre-heat the oven to 170°C. Line and grease 1 x 23cm round cake tin and 1 x 20cm round cake tin. Sift together the flour, cocoa, ground ginger, cinnamon, bicarbonate of soda, baking powder and salt. Set aside. Whisk together the butter and the sugars for a few minutes until light and fluffy. Add in the eggs one at a time, then the vanilla extract. At this point the mixture usually looks curdled but don’t worry it will come back together. 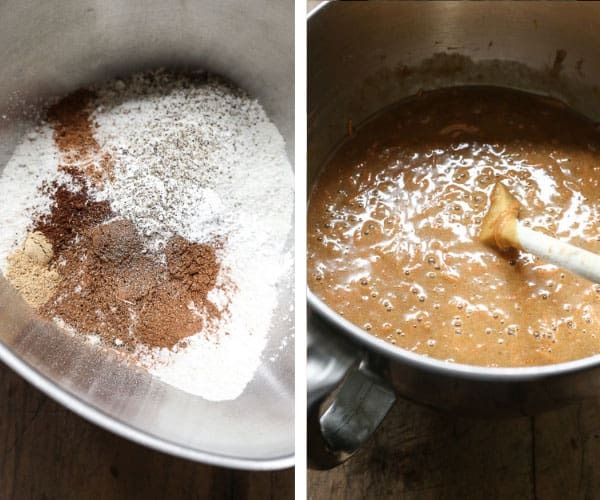 Pour in the melted chocolate and whisk together until completely combined. Add the flour mixture alternately with the milk, adding the flour in three additions and the milk in two (begin and end with the flour), scrape down the sides of the bowls as needed. Pour in the boiling water and mix until just combined. Pour into your prepared cake tins, then scatter the chocolate chips on top, pushing them down slightly into the batter. Bake for 45-50 mins but do check after 30 mins and if your cakes are browning too much then place some foil over the top for the rest of the baking. Check they are ready by inserting a metal skewer into the cakes – it should come out clean. Leave the cakes for 10 mins in their tins before removing then cool on a wire rack completely before cutting in half width ways then frosting. Heat the egg whites and caster sugar in a bain marie, stirring constantly until the sugar has dissolved and the temperature has reached 71°C. Change the attachment to a paddle attachment. On a low speed add the butter slowly cube by cube. When you have almost added all the butter the mixture will look curdled. Do not fret – this is supposed to happen and just means you are nearly done. Just continue to add all the butter. Once the butter is totally incorporated the frosting will miraculously become a smooth velvety consistency. Add the vanilla extract, the stem ginger plus the syrup and the salt. Mix until thoroughly combined. Sift the flour, cinnamon, ginger, cloves, nutmeg, salt and bicarbonate of soda together. Rub in the unsalted butter with the tips of your fingers so it resembles breadcrumbs. Set aside. In a stand mixer beat the sugars with the eggs, treacle and vanilla extract until fully combined. Pour the liquid ingredients into the dry and bring together with your hands to form a dough until everything is combined and you can pat it into a smooth ball. Wrap in cling film and chill in the fridge for a couple of hours. Whilst it is chilling you can make your templates. Remove the dough from the fridge and start your rolling and cutting. I rolled just a small amount of dough at a time due to space. Form each piece of dough into a round ball then roll out using a silicone roller to avoid sticking. The dough will be a little tough at first but will soon start rolling out beautifully. Use 5mm spacers on either side of your dough so you can ensure it is all evenly rolled to exactly the same depth. Place your card templates on the dough then cut out with a knife. Place each house on a baking sheet with about 2½ cm gap in between. They shouldn’t spread out but it’s good to be careful. Put the baking sheets in the fridge and chill for 30 mins. Meanwhile preheat your oven to 180°C. Bake the gingerbread houses for about 6-8 mins each. They are ready when you can barely see the corners just start to crisp but the middle of the biscuits should still be a pale golden brown. Leave to cool on the trays. Decorate with royal icing any way you wish.